With the increasing popularity of professional digital cinema cameras from Canon, ARRI and Blackmagic Design, the use of CFast 2.0 memory cards has soared, and the need for a truly high-speed card reader is undeniable. With current CFast 2.0 cards’ rated read speeds near 550 MB/s, it’s clear that USB readers don’t fill that need. Sonnet’s SF3™ Series - CFast™ 2.0 Pro Card Reader does. Featuring a 40Gbps Thunderbolt™ 3 interface, this device quickly ingests footage from CFast memory cards to any Mac or Windows(1) computer with Thunderbolt 3 ports—on location, in the studio, or in the edit suite—at the fastest speeds the cards will support. As the industry’s first CFast 2.0 card reader for Thunderbolt 3, the SF3 Series - CFast 2.0 Pro Card Reader employs its dual card slots to take advantage of the tremendous bandwidth offered by Thunderbolt 3. Capable of ingesting files simultaneously from two cards at concurrent data transfer speeds up to 1000+ MB/s—more than double the average ingest speed of USB 3.0 card readers—using the Sonnet reader makes for a significantly more convenient and efficient workflow. The SF3 Series - CFast 2.0 Pro Card Reader connects directly to your Mac or Windows computer’s Thunderbolt 3 port or at the end of a Thunderbolt 3 device chain. Requiring only a single cable to connect to your computer, this high-performance Sonnet reader is bus powered (no separate power supply required). 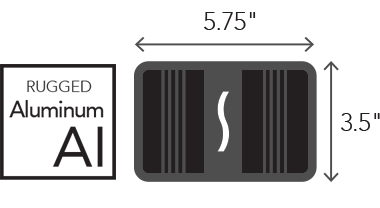 Measuring a compact 5.75 inches wide by 1 inch high by 3.5 inches deep, the SF3 Series - CFast 2.0 Pro Card Reader is suitable for use in any workspace, even where space is tight. The reader’s shell is made from extruded aluminum, making it lightweight, and yet rugged enough to be transported in an equipment bag without fear of damaging the case. Through the use of a captive cable, the SF3 Series - CFast 2.0 Pro Card Reader’s Thunderbolt cable remains firmly connected to it at all times. Should the cable ever break, it can easily be replaced by Sonnet or a Sonnet-authorized service center. Windows computers require the latest firmware (BIOS) and Thunderbolt drivers to support this product. Check with your computer manufacturer for update information. Compatible with all major brands. Wyse brand CFast 2.0 cards are not compatible.